All women want shorter, easier labors! Unfortunately standard birth procedures stack the deck against us. Giving birth upright is beneficial to mother and baby, but over 80% of us give birth lying on our back in the lithotomy position. The lithotomy position is the most common birth position in NJ hospitals. On our back, legs in the air. I don’t know about you, but this is not my go to position for feeling powerful. So why are we in this position? Doctors and nurses prefer it because it is easier access to the mother and baby. Most use it because that is all they know! Research is clear that this position is not beneficial to the birthing woman. There is good news though. More doctors are working with women to birth in the position they prefer. 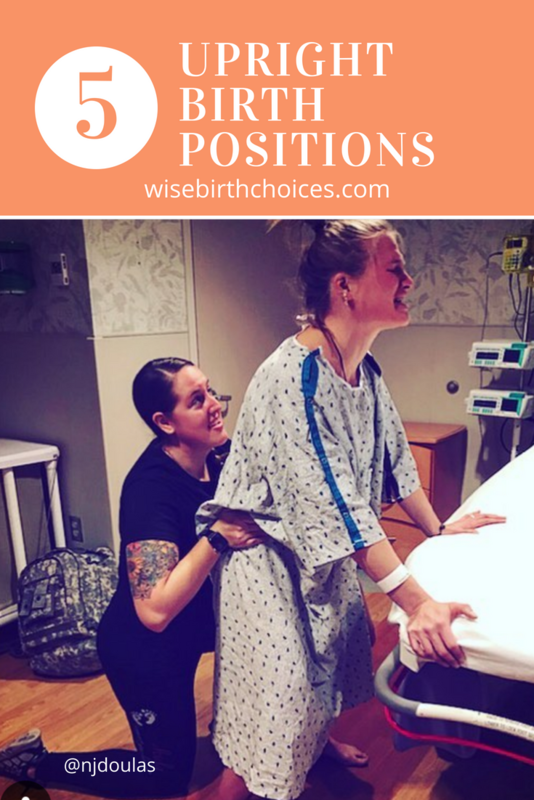 You should be asking your provider about birthing in different positions. If they are not comfortable, consider shopping for a new provider and consider choosing a midwife! Here are five positions that can support a more productive and easier labor and delivery. Standing and walking activate the muscles in your pelvis, which will reduce discomfort and give the baby lots of opportunity to descend and rotate, Gravity works with your body to help bring the baby down. Baby’s head is able to apply direct pressure to your cervix, helping speed dilation. You can slow dance with your partner, walk, sway, lean, bend or squat. There is so much variation available in this position. Most midwives are comfortable catching your baby while you are standing. Reach out to us for a midwife suggestion in your area. Squatting is a very powerful position to use when pushing. Squatting opens the pelvis and gives the baby more room to get in the best position. Gravity works with your body to help bring the baby down. Since most of us don’t squat on a regular basis, It’s a good idea to practice throughout your pregnancy. Make sure you build up slowly, a few squats, a few times a day. Make sure you are holding onto something like your bed frame to give yourself the support you need. Most hospitals have squat bars that attach to the bed so you can support yourself in a squat for pushing. Being on all fours “Hands and Knees” can include leaning forward over your birth ball or CUB. You can do this on the hospital bed if you need to be continuously monitored. This position is helpful in reducing discomfort in your back during contractions. Many women instinctively adopt the hands and knees position when they feel the urge to pushing. This position opens your pelvis and allows you to rock back and forth to give yourself added relief during contractions. I lived on my birth ball when I was in labor. Sitting on the birth ball or CUB allows you to rotate your hips through the contractions. Toilet sitting is fantastic during labor. You can even sit facing the tank and put some cushions there so you can rest and lean forward in between the surges. Once again, gravity is working with you in this position. If you are on the hospital bed, you can request a squat bar so you can stay seated in between contractions and move into a squat during the pushes. This position is commonly used with midwives. It’s great for being able to rest in between pushes, especially if you are tired or need support being upright. You have been told to avoid lying on your back throughout your pregnancy, so you already know that laying on your side avoids putting pressure on major blood vessels. This position helps keep good blood flow to your baby. 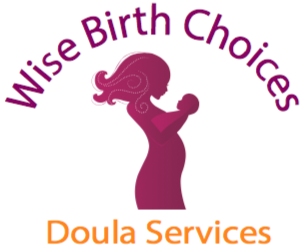 Having a doula greatly increases the likelihood that you will deliver in an upright position. Set up a complimentary consultation and learn how a Wise Birth Choices Doula can contribute to your positive birth experience. Message us here or call/text 732-754-9551 and we will get you set up for success!